T Tyron Smith vs. Edge Bruce Irvin – In Weeks 13 and 14, Cowboys offensive tackle Tyron Smith allowed only one pressure on 60 pass-block snaps, collectively. His pass-blocking efficiency (measures pressure allowed on a per-snap basis with weighting toward sacks allowed) of 98.8 during Weeks 13 and 14 is tied for the sixth-highest mark among 68 qualifying offensive tackles. Bruce Irvin has lined up on the right side of the defense on 83.2 percent of his pass-rush snaps, and his eight sacks from the right side are tied for the seventh-most among edge defenders. 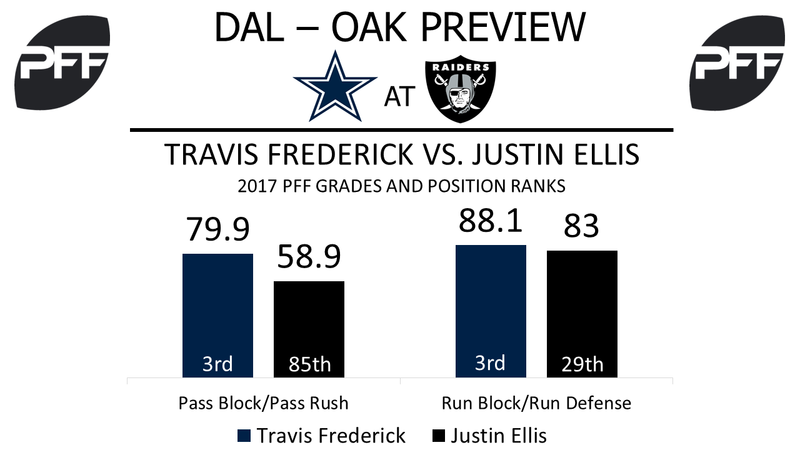 C Travis Frederick vs. Dl Justin Ellis – Travis Frederick has allowed only 10 pressures on 450 pass-block snaps this season, including no sacks. Frederick did not allow a single pressure last week against the New York Giants, and his pass-blocking efficiency of 98.3 this season currently sits at eighth among 35 qualifying centers. Justin Ellis has struggled to rush the passer, currently fielding a pass-rush grade of 58.9, 85th among 109 qualifying interior defenders. He’s registered only seven pressures on 148 pass-rush snaps, giving him a pass-rush productivity of 3.7, which ranks 94th among 110 qualifying interior defenders. Ellis has impressed in his play against the run, where he ranks 29th among 125 qualifying interior defenders with a run-defense grade of 83.0. His 18 run stops are tied for the 28th-most among interior defenders. WR Dez Bryant vs. CB T.J. Carrie – Dez Bryant was targeted five times last week, bringing his total on the season to 108, the eleventh-most among wide receivers. His overall grade of 80.3 currently has him tied for 23rd among 116 qualifying wide receivers. Despite the struggles in the Raiders’ defense, T.J. Carrie has quietly put together his strongest season to date. His overall grade of 80.9 has him tied for 30th among 118 qualifying cornerbacks. Carrie is, however, allowing a 109.5 quarterback rating when targeted, which ranks 100th among 120 qualifying cornerbacks. Carrie moves into the slot when the Raiders go to nickel, but he remains on the outside in base, so he’ll see a lot of Bryant this week. 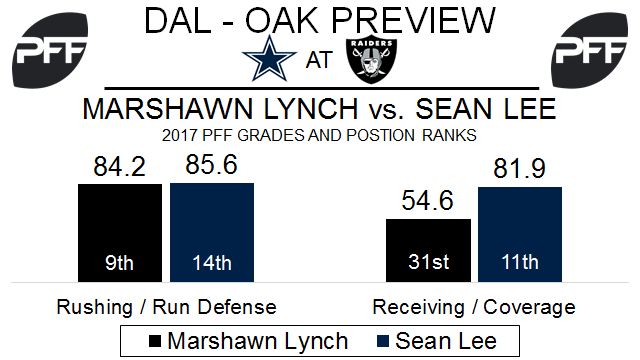 RB Marshawn Lynch vs. LB Sean Lee – Lynch was underutilized in Week 14 after Oakland fell behind early and abandoned the running game. He is the ninth-ranked running back with an 84.8 overall grade. Among running backs with 150 or more touches this season, Lynch is sixth in yards after contact per attempt (2.86). Lee is a difference-maker for the Cowboys, as Dallas has only won one of the five games this year that he didn’t play. He’s the eighth-ranked linebacker this season with an 86.0 overall grade. Lee is second among linebackers with an 11.9 percent run-stop percentage (plays resulting in a “win” for the defense). T Marshall Newhouse vs. Edge DeMarcus Lawrence – Playing in the AFC West, Newhouse is asked to block a premier edge defender almost every week, and nothing changes for the veteran tackle this week. He has surrendered seven sacks this season, the fourth-most of any offensive tackle. Newhouse has allowed 28 total pressures and ranks 49th at offensive tackle in pass-blocking efficiency (pressure allowed per-snap with weighting toward sacks). Lawrence is the third-ranked edge defender with a 92.8 overall grade. His 14 sacks are second-most of any player, and he’s fourth among edge defenders with 64 total pressures. TE Jared Cook vs. S Byron Jones – Cook has been a solid addition to the Raiders passing game this season. He’s 10th among tight ends with 1.66 yards per route run and eighth with 1.56 yards per route run from the slot. Like all Oakland pass-catchers this year, Cook has struggled with drops. His five dropped passes are the fourth-most among tight ends. Jones is 62nd of 88 qualifying safeties this year with a 68.9 overall grade. In coverage, his five touchdowns allowed are second-most at safety. Jones is ranked 54th among safeties with 0.65 yards per cover snap. He’s been targeted 50 times in coverage, the fifth-most of any safety.